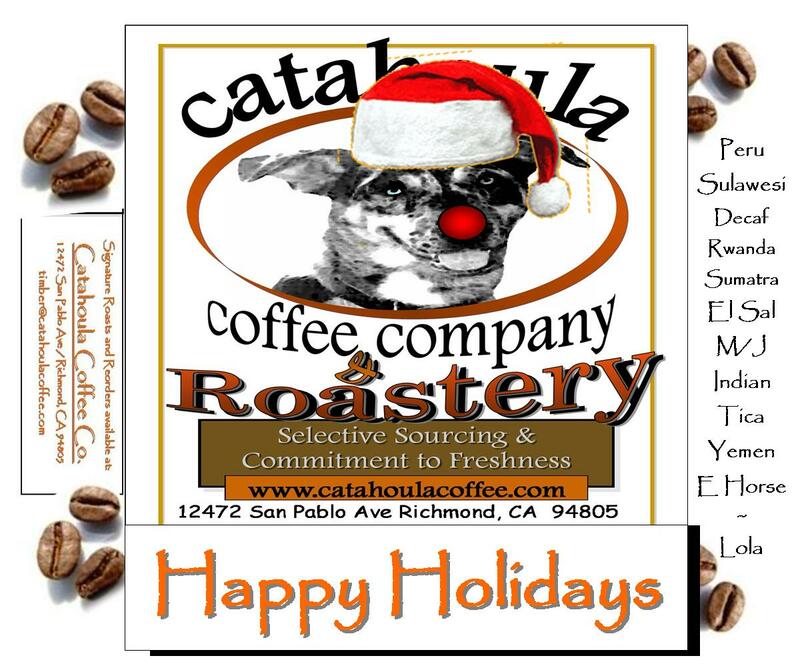 Greetings to everyone and I am sorry I have not written our beloved newsletter for the past couple of months.Â Â Needless to say I have been rather busy both personally and especially with Catahoula Coffee. On September 18, 2010, to the dismay of a great many of my single female Catahouligans worldwide, not to mention a couple of the fellaâ€™s too, I got married to the lovely Kate. Â Â My first and last marriageâ€¦It took this long to find the right one. Â Thank you for all the wonderful best wishes!Â We appreciate them. Catahoula Coffee has been increasingly getting busier and busier, heck we were even knock a star on YELP.com by not having enough â€œElbowâ€ room.Â Â I guess I would take that as a grand compliment.Â It sure beats the many months of Ricky and me watching Youtube videos of Will Farrell doing imitations of Sir Sean Connery waiting for that lone customer to grace our doorway. Since Catahoula Coffee has won the San Francisco Chronicleâ€™s Best of Bay, we have steadily been working on improvingâ€¦and refining everything we do.Â Â Our goal is always to not only be the best in Richmondâ€¦but of the whole bayâ€¦..err, Nation! 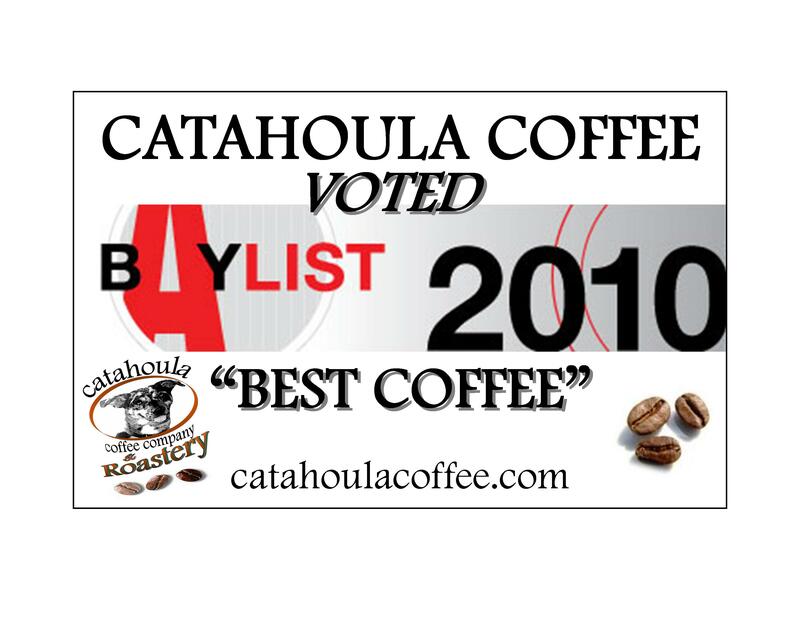 I would like to say thanks to all of the Catahouligans who not necessarily voted for Catahoula Coffee as Best of Bayâ€¦but who frequent our humbled establishment.Â Â To say â€œThanks! !â€Â We will sponsor a Customer Appreciation Day.Â Â I am not sure whenâ€¦It might be too busy prior to the holidaysâ€¦and would be nice to dovetail it into our next car meet.Â Â If you have any suggestionsâ€¦please email them to me:Â [email protected] I appreciate your feedback. We finished just outside of the money.Â It wasnâ€™t from the valiant effort of Catahouligans near and farâ€¦.It was an unique contest whoâ€™s rules were a bit dodgy.Â Â Catahouligans help us to charged out of nowhere to claimed the third place moneyâ€¦but were bumped, nipped and/or squeezed out, by what this cub reporter feels as â€œVote Tradingâ€ from the others playgrounds in contention.Â Â Needless to say, we finished fourth by the smallest of margin. Pre-Made Gift Baskets.Â Â Ranging from $15.00 to $45.00 -Â If you donâ€™t see what you likeâ€¦weâ€™ll make it up for you. Catahoula â€œHoula Moolaâ€ Giftcards:Â Give the gift that keeps on giving.Â Â How Easy was thatâ€¦..Add any amount to the cardâ€¦then they are able to redeem the cardâ€¦.and earn free drinks to boot. Travel Mugs / Stylish Diner Mugs / AeroPress Coffee Makers:Â Â These are few items available for this Holiday Season. Customized Labels (Seen Below) :Â Minimum of six pounds orderedâ€¦you can then have a custom message to given out to those on the â€œNiceâ€ column of your Whoâ€™s Naughty or Nice list. New Teeshirts:Â The â€œLolaâ€ tee is winner!! If I have forgotten something:Â Â Â Youâ€™ll let me know! Tote Bags: Â Custom made Tote Bags made from Recycled (or Upcycled) coffee bags used at Catahoula Coffee.Â Â They range from $15 to $40 apiece. Cup Snuggies: Way Cool cup holders made by Greenbeings of Scranton, PAÂ Â Personalized with logo of your favorite coffee companyâ€¦..Catahoula right! ?Â Â Not too sure what the pricepointâ€¦.roughly:Â $10.99 or 11.99Â Â Â Reusable!!! If you have not heard of Mi Pueblo yetâ€¦.You should. ( www.mipueblofoods.com )Â I firmly believe our neighborhood would be an EXCELLENT candidate for this organization.Â Itâ€™s not like we donâ€™t have a couple of prime locations for a clean, well lit and quite well stocked grocery store.Â Â Can you say: Â â€œTHE OLD ALBERTSONâ€™S STORE!! !â€Â Â Â Â Â But there is also Safeway when it goes dark and even an outside chance of West Coast Motors site. I am willing to bet anyoneâ€¦. and I mean anyone:Â If Mi Pueblo would locate within the area of San Pablo Ave & Mcdonald Aveâ€¦.it would be extremely successful.Â Â Not only would they be supported by the surrounding neighborhoods of N&E, View & El Cerritoâ€¦.but it would draw folks out of the hills and down to the AVENUE. Pre-addressed â€œWe Want Mi Pueblo on the AVENUE!â€ postcards will be soon available at Catahoula Coffee Company. 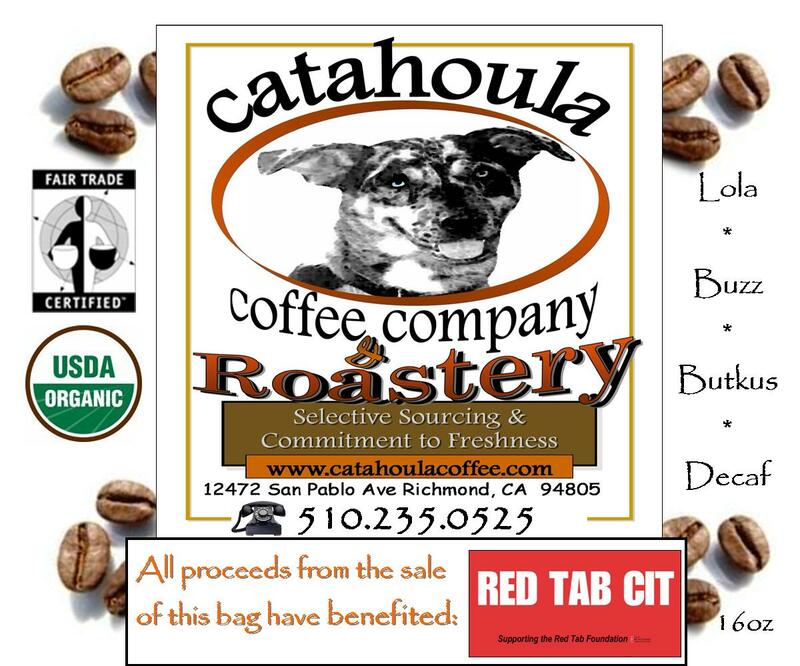 Catahoula is now a member of the Green CafÃ© Network. 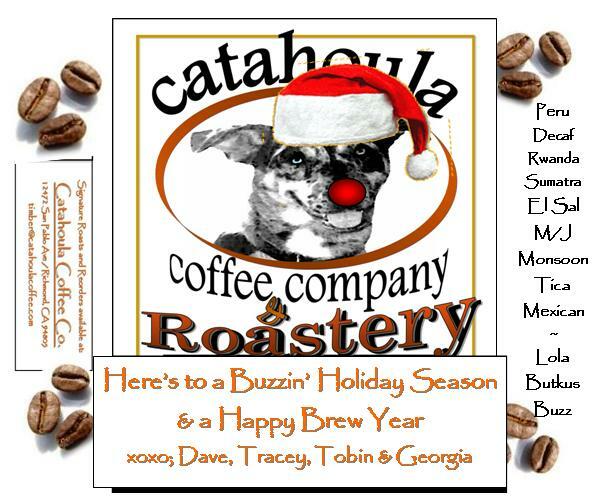 Facebook has become a popular way to keep the ever going list of Catahouligans informed of what is going on at Catahoula.Â It is fun and informative to see folks around the States (World) become, and follow the going-ons at Catahoula Coffee. Coffee prices have SKYROCKETED this past year.Â Â This is not just a swarmy businessman trying to juke you.Â Â Prices have increased due to several issuesâ€¦.mainly due to the â€œCâ€ market (Think Porkbellies) being played by folks who are looking for a return on their investments since global meltdown of their standard financial investments.Â Â Toss in political unrest in this country and bad weather in that country has also contributed in pushing coffee prices higher. I am doing my best to hold our prices at Catahoula Coffee.Â Â I am quite thankful of being in a position of advantage compared to the othersâ€¦.but coffee prices are coffee prices.Â Â I will always source the very best in terms of quality with an eye on promoting sustainability.Â Â It is a tough act to followâ€¦.but Catahoula Coffee will continue to strive in obtaining the highest quality in our coffees, all the while trying to improve our community. The Micro Roasts are small batches, (a couple of bags of coffee), I would like to feature for you try.Â Plus a Micro Roast is a single origin coffee which we currently carry such as Kenyan Peaberry.Â Â My goal is for the average Catahouligan to sample a coffee they wouldnâ€™t necessarily try or even know existed. Truly wonderful and inspirational stories behind them.Â The Peru Pangoa (FTO) is a fine example. What hasnâ€™t been said about this coffee, it is truly one of the BEST coffees in the world!Â This coffee is known to be rich, well balanced and yet with a buttery feel to the cup. I came across this coffee via a third party; kindaâ€™ a friend of friend sort of way.Â After reading up on this region and the works of other roasters/importers I was truly happy to see Royal Coffee Imports (RCI) had this wonderful coffee in stock.Â Â RCI was instrumental in the continual support of this coffee. This coffee has everything:Â Fair Trade, Organic, Shade Grown, promotion of economic diversification, all the while having a solid record of self reliance in improving the lot of both the farmers and its indigenous peoples. The coffee itself is wonderful Organic Peruvian, grown higher in altitude which produces a nice balance of complexity to its body. Tucked away in the central Amazon region of Peru, just east of the Andean mountain range that runs through the center of the country, CAC Pangoa (Cooperativa Agraria Cafetalera Pangoa) has been serving its members since 1977.Â The coop has experienced a colorful history of good and hard times.Â It was founded by 50 farmers from a coop in neighboring city, Satipo and grew to nearly 1700 members at its peak (in the early 1980s).Â With 3% of every sale, Pangoa was able to build most of the infrastructure that it uses to this day.Â During the period that’s known as El Terrorismo (“the terrorism”) when the Shining Path violently swept through what had up to the late ’80s the peaceful, isolated, rural areas of Peru, killing thousands of innocent people and carrying out a determined campaign of instilling paralyzing fear.Â CAC Pangoa lost hundreds of farmers who fled to cities to escape the terror.Â Since then, they have regained membership and currently serve approximately 600 members (2009). There are times we will roast a particular single origin to encourage folks to try something they normally do not see or get an opportunity to taste. Â Kenyan PB is prime example; however it may be a single bag of coffee I am experimenting with at the time. Thanks againâ€¦..I hope everyone has a great holiday!!! **Â Â If you would like to be taken off this listâ€¦no problemâ€¦..